The Dashboard (formerly "Your Component Menu") provides you with convenient access to all of your projects, forms, users and logiforms components. The Dashboard window is always open and can be accessed via the TaskBar at any time to quickly navigate to and open another component. While viewing components in the dashboard, you can click to open the component details panel, or right-click to choose from the actions menu. Note: The Dashboard is always open, but may be minimized. If it's not visible on the desktop, click the tab on the DashBoard button in the taskBar. Open a form by right-clicking the form icon in the Dashboard, then choosing Form Design Tools > Form Designer. Or, first click on the form, then clicking Actions > Form Design Tools > Form Designer. In the Forms group, simply click on a form to display several options. You can view Actions for the form, delete the form, or duplicate it. Actions are covered in more detail in the topic Form Properties Panel. You can filter what is shown in the dashboard using the Project Menu, Show Component Menu and the Free Text Filter. 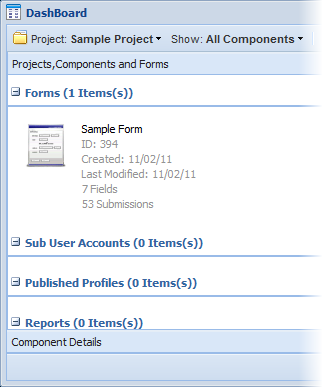 • Project Menu - Filter the results to include only components within the selected folder. • Show Component Menu - The show component menu allows you to filter by component type. For example, you could show only "Sub User Accounts" or only "Forms"
While these functions can be performed from the IconView layout, an extra step is required to first load the component into the Component Details Panel and then perform the action. The TreeView is preferred and more efficient for this operations. Clicking on a component in the Dashboard will load the Component Details Panel. The component details panel provides additional information and options for the selected component. What is shown varies based on the type of component selected.